(From left) Kojiro, Yoshika, Kentaro, and Tatsu will begin their journey to KK tomorrow. The Sakamotos are seen during their journey in the Bhutan countryside. 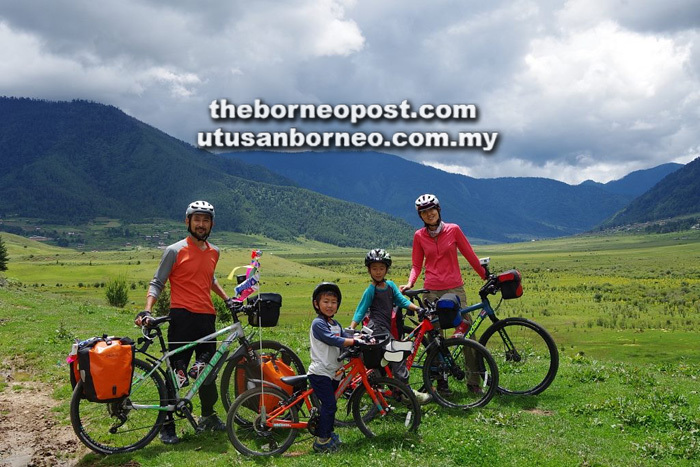 KUCHING: A family of four from Hyogo, Japan will journey from here to Kota Kinabalu this month, mostly by cycling, as part of their epic eight-year around-the-world adventure. The Sakamotos, led by keen cyclist father Tatsu, hope to experience different lifestyles and cultures through meeting various communities during their trip. He said sons Kentaro, 7, and Kojiro, 5, hope to spot animals along the way, while he and his wife Yoshika would like to enjoy the local food. “More importantly, we just want to meet as many local people as possible, particularly families with young children,” he said during a recent interview. They will head out to Pusa tomorrow (Aug 3), an approximate 200km ride. From there they will take a boat to Sibu, after which it will be a bus ride all the way to Miri, before pedalling again through Brunei and towards Kota Kinabalu. “We have to be in KK by Aug 29 to catch a flight back to Japan,” said Tatsu. The family has just completed a two-week journey around Bhutan. Before that, they were in Nepal for one month. East Malaysia is their last stop for this stage of their cycling adventure known as ‘The Sakamotos’ Great Six Continents Adventure’. This is the fourth year that Tatsu has travelled by bicycle with his family. “I had my solo around-the-world cycling trip when I was in my 20s and 30s. It took me four years to cover 43 countries. “After Yoshika and I got married 10 years ago, I wanted another adventure. I kept visualising the next adventure with my family. It took me a while to convince Yoshika, and by the time we had our sons, we decided it’s best to go on our adventure every summer holiday. “Travelling with family is certainly a different kind of experience. Difficult at times but fun,” he said. In 2015, the young family travelled to Auckland, New Zealand, where they spent three months. For the second stage the following year, they cycled the Unesco World Heritage pilgrimage route of Camino de Santiago in Spain before heading to Portugal and Switzerland. Last year, they were in Canada and Alaska. Tatsu said they chose East Malaysia because not many people in Japan know about Sarawak and Sabah. “Most people know Borneo the island, but they do not know the specific places. I also want my sons to experience the different cultures that can be found here,” he said. Citing an example of when they had problems finding a suitable campsite in New Zealand, Tatsu said some of the best memories and lessons on the road came from meeting people, who extended their hospitality and kindness to the family. “A passer-by helped us when we were caught in a strong wind and unable to set up camp. She brought us to her house, which was still under renovation, and let us stay there. We were very happy with the unexpected offer of help. “She has two home-schooled children, and she said her act of kindness is a form of education for them too. Children watch parents and learn. “We did not expect such a situation, yet we ended up with this learning experience,” he recalled. He noted that his sons have also begun to pick up lessons on kindness. “Yoshika asked them, ‘What do you do if you see someone in trouble?’ Ken answered that they can stay at our house, while Ko said they can play with his toys. We never taught them that way, but they learnt through experience. “I started this as my dream, but now with my sons, I believe our adventure has become an education in giving them valuable experiences. We can learn many things from TV and the Internet, but nothing can substitute real-life experiences,” he said. With four more years to go in ‘The Sakamotos’ Great Six Continents Adventure’, the family has yet to decide on next year’s destination, but it could involve Africa, South America, or other parts of Asia. To follow the Sakamotos’ adventures, visit tatsuoffice.com or their Facebook page.